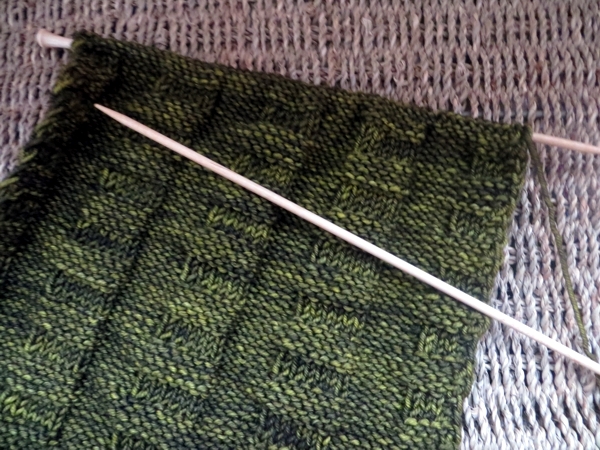 In a perfect world, we knitters would be content to work on one project, finish it, and only then buy the yarn for the next. And after three or four such peaceful, patient projects, we would make something with the scraps left over. But in the real world... well. I mean after all, we have to do our part to support the yarn industry that feeds us, right? 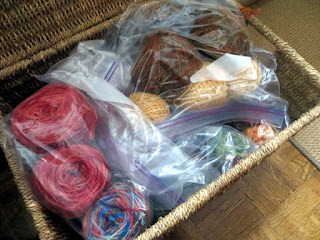 I am pretty sure that most of us have more yarn than we need right now or for the next three years probably, and in my case, that is many times too much. The house is not going to give me any more yarn storage space than I have right now - in fact, it is going to give me a good deal less. I'm not sure even now how that's possible but it is true. It is also true that it will be a lot easier to hit the ground running when we do get back there, if I sort out the yarn situation now. 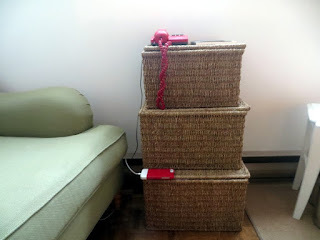 These three baskets are serving as a telephone table and iPhone charging station at the side of my secondary office (I am more disciplined working at my desk, but the armchair has better light and is closer to my teapot.) 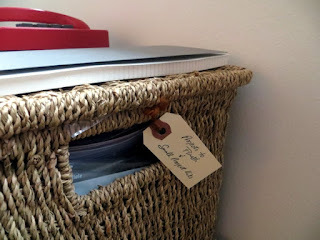 For years at the old house, they stored fabrics and finished projects I was sure I'd get around to using eventually. I dealt with those before we moved to the condo, and as we settled in, I filled them back up with yarns that fit the same category. No more. Those yarns are gone, and now the baskets are for go-to knitting. The top basket is all about half-done projects I'm not working on every day, and small ones I could start and finish at any time, like pom poms or felted wool brooches. Yep, I decided on a use for all the ends of yarns I've been keeping just in case I needed to tie a tag on a parcel - they'll become pom poms, or they'll be embroidered onto felted wool, or they'll get knitted into little keychain-friendly holders for lip balm. Done. The middle basket is full of kitted-up projects I can start when the current roster is done. This one includes socks and shawls and hats, their clear bags complete with a note telling the future Me what I intend to make with the yarn inside. 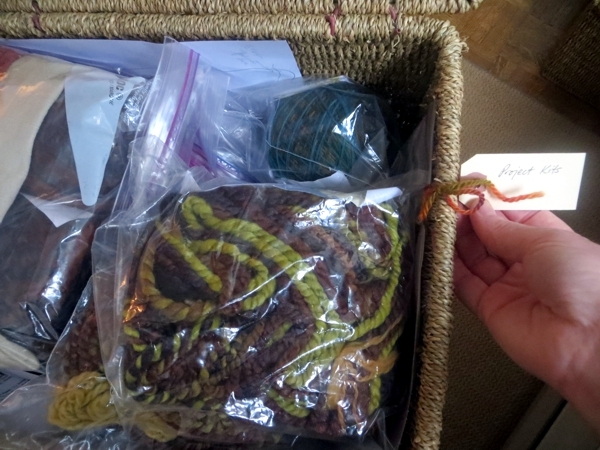 The bottom basket is the largest, and it's full of the current supply of wool/mohair sock kits. Next time I go to cast one on, that's where I'll look. I'm not sure this basket is full enough. I heard yesterday that Silvia has decided to go back to yarn and fiber as something to enjoy for herself, rather than as a business for the rest of us. 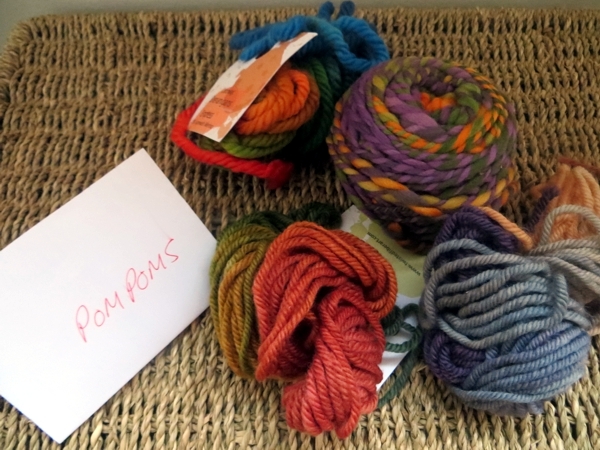 And while I totally applaud that - somebody as talented as she is should be allowed to enjoy her own fantastic yarn - I am kind of nervous about the possibility of my own supply running out. Hmmmm. There is more yarn in another cupboard, of course... and a basket full of fiber for spinning as well... but I have time to deal with all of that stuff because it looks now like we won't get back into our house till the summer. 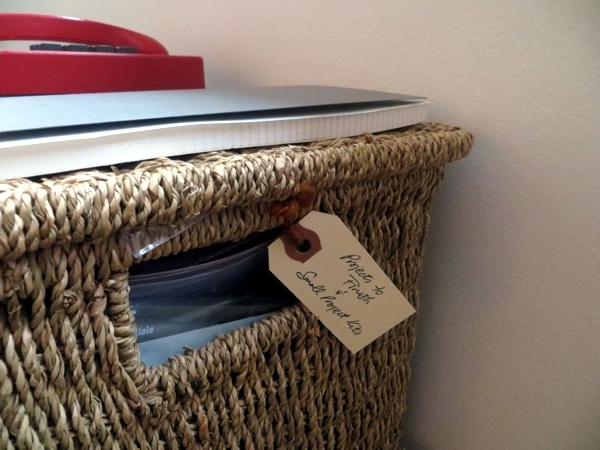 Have you ever used categories to sort out your yarn stash? All tips welcome! I have a large basket that I use as a bedside table, in it is ready caked sock yarn (in ziploc bags), along with my sock patterns and appropriate knitting needles. Fir ne that's the height of organisation!